After many years ageing in the unique and ancient Crayères acquired by its founder Charles Heidsieck, Brut Millésime reveals itself as a champagne poised between elegance and complexity, with a smooth texture and great length on the palate. Extended ageing on the lees has unlocked the full potential of their aromas. Each vintage has its own signature, its own generous tone. Weather:The 2000 vintage was seen by many as a miraculous year. The vines were hit by heavy rain, storms and hail in the winter, leaving a successful harvest on the brink. However, the vintage was saved by the hottest August and September in fifty years, providing the grapes with much needed sunshine and warmth. This champagne is part of Charles Heidsieck Collection Crayeres, a second late release of vintages direct from their cellars in Reims in December 2017. The releases are very limited quantities and a perfect chance to buy and enjoy champagne with age in its very best condition. We have 24 bottles available. News Article: Read about our visit to Charles Heidsieck and tasting with cellar Master Cyril Brun of some of the Collection Crayeres Champagnes here. Tasting Note: A stunning champagne created from a relatively hot year; rich golden colour with aromatics of sweet apricots and lemon, the palate is long and rich with a perfect acidity and luscious finish is full of almonds and toasty brioche notes. Of the three Champagne houses named Heidsieck - all originating from families once related - Charles is the smallest and arguably, the best. 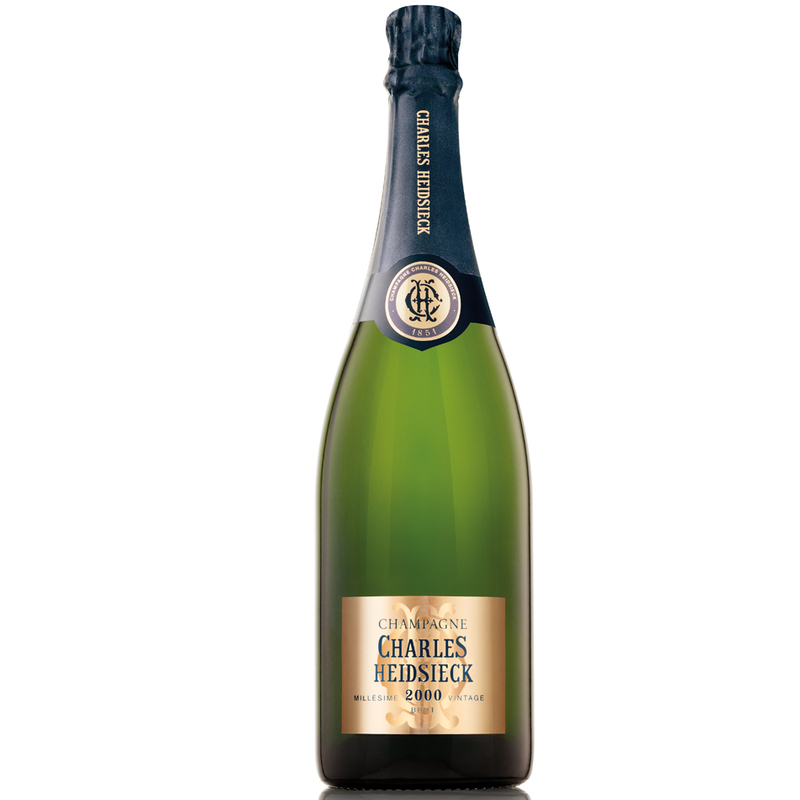 Established in 1851 by the nephew of Piper-Heidsieck's owner, Charles Heidsieck himself was the original 'Champagne Charlie'. He gained the nickname during his travels around America in the mid-19th Century - a country whose introduction to Champagne is credited to Charles. Today, production occurs alongside sister company Piper-Heidsieck in an ultra-modern functional cuverie on the southern outskirts of Reims. Charles Heidsieck champagnes have a rich history of being served at various infamous events; it was the chosen Champagne of the European royalty in the late 1800s; a photograph from Robert Falcon Scott's fated expedition to Antarctica shows the party drinking Charles Heidsieck at their Christmas dinner; in 1977 the house produced a special vintage for the Silver Jubilee of Queen Elizabeth II and in 1981 a 'Royal Wedding Cuvée' was served to celebrate the marriage of Prince Charles and Princess Diana. When Charles Heidsieck was born in 1822, his uncle – who married into the Piper family – was running the Champagne House Piper-Heidsieck. Charles grew up in the vineyards and gained experience at his uncle’s business, but his ambitious winemaking philosophy led him to found his own Champagne House in Reims in 1851. He was so proud of his Champagne that he named it after himself and Charles Heidsieck Champagne was born. A year later, having found success in Europe, Charles took the brave decision to travel over the water to the USA to sell his wares. Here, he was one of the first to introduce Champagne successfully to the country. His vivacious personality gave him notoriety and popularity and he famously became known as ‘Champagne Charlie’. Charlie had an eventful few years in America, including being imprisoned in Louisiana on suspicion of being a spy during the Civil War. He was eventually freed by President Lincoln himself and then returned to settle in Champagne. Unlike his peers, Charles viewed himself as a blender and not a grower and spent most of his money investing in forty-seven underground chalk cellars dating back to the 11th century, instead of purchasing land. He began buying grapes from trusted grower families with expertise in perfecting the care of their vines going back generations. The company now has 60 separate sites to choose from, encompassing a variety of different Crus, and some of these plots are cultivated by the fourth or fifth generation of the same family. Charles Heidsieck is a hand-crafted champagne. The intricacies of its complex make-up have been perfected over the years by one of the most celebrated winemaking teams in Champagne. Between three winemakers they have been awarded Sparkling Winemaker of the Year at the International Wine Challenge twelve times, an award no other house has won more than twice! The flagship cuvée, Brut Réserve, is the house’s masterpiece. Many years in the making, the wine is a blend of 60 of the best vineyards and harvests going back more than 15 years. It is aged in the House’s Roman chalk cellars under Reims, which provide an ideal environment to age the wine, having a unique combination of constant temperature, high humidity levels and no sound, light or vibration to disturb the wines. The non-vintage champagne is made with painstaking attention to detail - Charles Heidsieck are famed throughout Champagne for their immense range of over 400 reserve wines. Once the team has decided on the blend, the wine is typically aged for six years on its lees which adds a richness and complexity unrivalled in any other non-vintage champagne. Since 2011, the company has been owned by the Descours family – a very positive move ensuring the company remains family-run with a long-term vision for the future. In early 2015, Cyril Brun took over as Cellar Master, having been assistant winemaker for many years at Veuve Clicquot.